Your account has been created! Please check your email for more details. WebID must be 3 uppercase letters. Please provide your company's webID. This Career Center ID is already in use. Please try something else. Please provide your location's name. You must provide a stateID for the location. Please provide your recruiter's name. You must provide the initials for this recruiter. This will also be used to log in. Why use MedCruiter as your ATS provider? MedCruiter provides Physician and Healthcare Recruiting Professionals with a collaborative suite of tools to attract, manage, market and hire the best talent - FAST. We provide the tools to automate and rapidly expand your private candidate databank/database. Manage relationships with current clients and prospective business opportunities. Manage all job orders and track progress with candidates and contacts. Our team co-brands and hosts a custom Career Center that looks and feels like your current website design. * This feature requires an active membership with/on each site you are sending jobs to. What makes the Medcruiter system stand out from the crowd? Our system is specifically designed for healthcare recruiters. We do not accept any clients that are outside of the healthcare industry. This allows us to build more focused recruiting tools for our clients. Do I need any special hardware of installed software? No. The Medcruiter system is 100% web-based and can be accessed without special hardware or software from any internet-ready device. How much disk space am I allowed on Medcruiter? Your first 1GB of data is included in your agreement. Additional space can be added as needed. 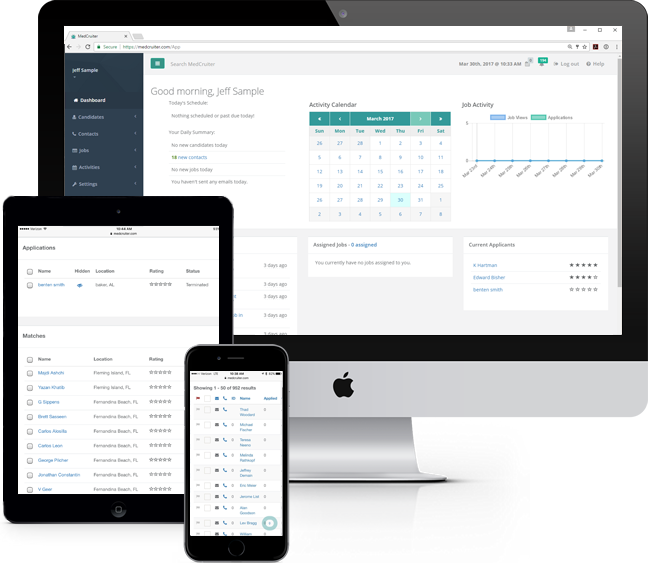 Do you have scheduling or billing tracking module? No. The system is built for recruiting and only recruiting. There are other products avaialble online that focus on those areas. Can you convert my data from my current software package? Yes. We can convert data from other ATS/databank providers. Please contact sales regarding possible associated costs. Most accounts are created within only three to seven business days! Do you still have questions about our service? Please feel free to contact us!